Every time I walk into my bedroom during this past week, I cannot help but smile. On the chest of drawers near my window, I have a few household plants – and two of them are flowering: the African violet as well as the Christmas cactus. What a treat! I am enjoying the colour especially as the skies outside have been grey. The blooms are perfectly timed as I can enjoy them before the Christmas decorations come out. Lovely both – my cactus is also flowering now. We need colours so much in all this grey November. It is so beautiful that I think I need to get more of these plants. I have a yellow one and a white one as well and love them too. What a pretty sight they must be when they flower. Perfect timing – late November, early December, grey skies, etc. We all need a splash of color in our lives! I agree. And I am loving it! African violets are beautiful, Colline. My mother loves plants and flowers. My mom too. Growing up, my mom had quite a number all lined up on a long table. So pretty when they flowered. They bring so much joy, don’t they? At ‘home’ we had an orchid that used to delight me. We haven’t yet invested in houseplants here but I expect we will. 🙂 🙂 Have a good weekend, Colline! I have three Christmas cacti. One is flowering beautifully. One had buds which all dropped off and the third has not done anything. My second is not flowering either. I don’t think it is in the right spot and have recently moved it. I think they like a lot of light. The timing is definitely perfect! 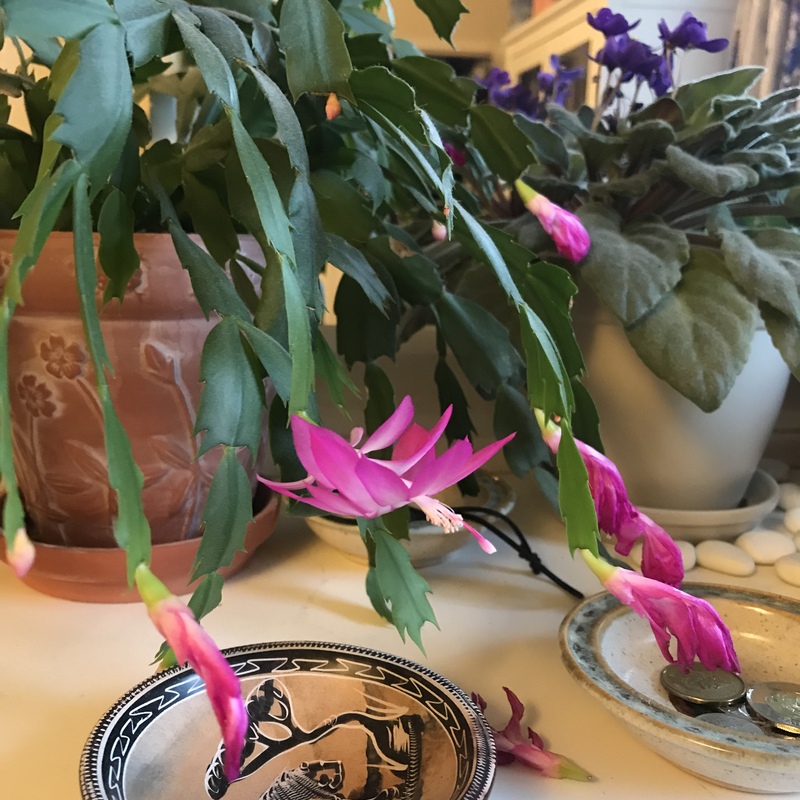 I have had my cactus flower in summer – it is the first time it is blooming around Christmas time. A neighbor gave me two orchids before she left for 6 months in Florida. I’ve got to read up on how to give them the proper TLC. I remember my aunt doing that.